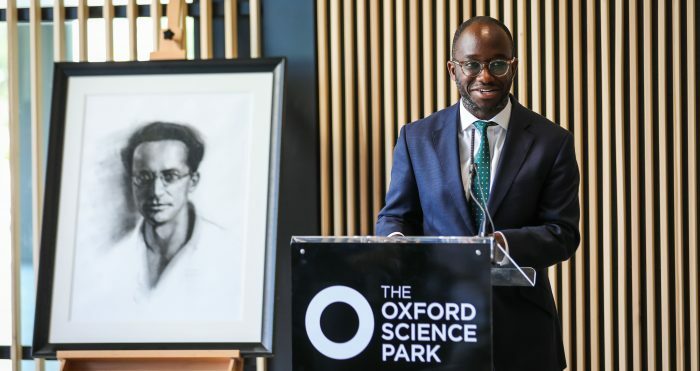 Oxford, UK, July 5 2018 – The state-of-the-art Schrödinger Building at The Oxford Science Park, one of the UK’s leading parks for science and technology companies, is to be opened this afternoon by Sam Gyimah MP, Minister of State for Universities, Science, Research & Innovation. Architecturally inspiring and built to promote collaboration and cross-fertilisation of ideas, the four-storey office and laboratory facility is part of the programme of investment on the Park which has been ongoing since 2016. The building is named after Professor Erwin Schrödinger, recipient of the Nobel Prize for Physics in 1933 and an alumnus of Magdalen College Oxford, which owns The Oxford Science Park. As well as declaring the Schrödinger Building open, the Minister will hear about the work of 3D technology innovator Fuel3D and Oxford Sciences Innovation, its first two occupiers. A third occupant is expected to be announced shortly. At 61,500 ft2 (net internal area), the £13m Schrödinger Building is the largest speculative Grade A office building to be developed on The Oxford Science Park and the first new building on the Park since Magdalen College became its sole owner in 2016. It is expected to house over 300 people once completed, and features a roof terrace overlooking the Park. Schrödinger’s legacy is celebrated in the building’s reception area with a backdrop panel highlighting the wave-particle duality which underpinned his Nobel Prize-winning work. The Schrödinger Building was designed by Bogle Architects. Photos of the Schrödinger Building and Opening Event will be available. Professor Erwin Schrödinger was a Vienna-born theoretical physicist who won the Nobel Prize for Physics with Paul Dirac in 1933. The Prize was awarded “for the discovery of new productive forms of atomic theory” in the field of quantum mechanics. In this work, assuming that matter (e.g., electrons) could be regarded as both particles and waves, Schrödinger formulated a wave equation that accurately calculated the energy levels of electrons in atoms. The Schrödinger wave equation enables the energies and properties of molecules and materials to be predicted accurately and forms the basis for understanding many 21st century fields of science including chemistry, materials science, semiconductors, nanotechnology and molecular biology. He is also noted for his ‘Schrödinger’s cat’ thought experiment. Professor Erwin Schrödinger was a Fellow of Magdalen College Oxford from 1933-1938. The Oxford Science Park is owned and managed by Magdalen College, Oxford. Created in 1991, the Park upholds the College’s heritage and provides one of the most influential science & technology environments in the UK. There is more than half a million square feet of workspace accommodation across the Park, which is now home to nearly 2,500 people and more than 80 businesses. These range from start-ups based in the Magdalen Centre innovation hub to major international companies and include Blue Earth Diagnostics, Circassia, IBM, OrganOx, OxSonics, Oxford Nanopore Technologies, Sharp Laboratories, Oxford Genetics, ProImmune and Oxford Technology Management.